» What’s up at Edgewater Village? What’s up at Edgewater Village? Street trees have been started, but no houses yet. 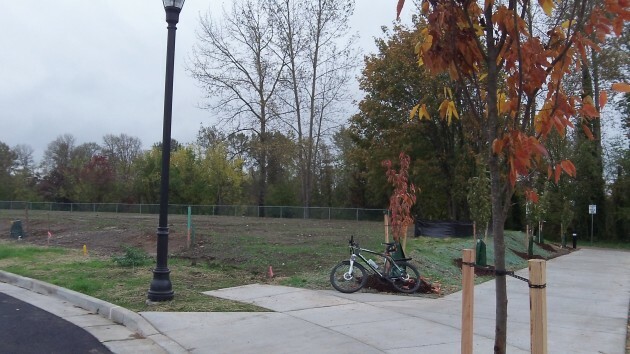 Edgewater Village is a planned residential neighborhood that everyone hopes will rejuvenate Albany’s riverfront on the Willamette. The hope is there, along with new sewer lines and new streets, but the first house has yet to be started. The public has an interest because CARA, the city’s urban renewal program, has spent $2.4 million on this project, the plans for which have changed several times over about the last seven years. 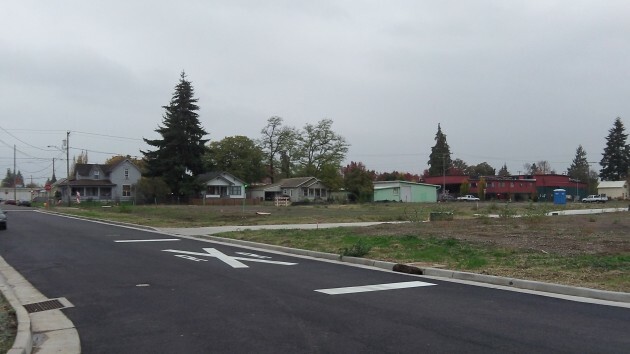 In February, when a contractor started putting in utilities and streets on part of the 6-acre site between Water Avenue and the river, the city expected construction of the first five houses to start in March and be finished in September. But in May, the CARA board modified its contract with Edgewater Village LLC and extended its deadines. Developer George Diamond, of Lake Oswego, at the time expected to break ground on the first house in September. But it didn’t happen that month, or in October. Last week, urban renewal manager Kate Porsche passed along an explanation from Rich Catlin, chairman of the CARA board who works on the project in his private employment as a planning consultant: While the street work is complete and being checked by the city staff, there’s database work to be finished by the county assessor’s office in assigning tax lot numbers and creating tax accounts. When that is done and the information has been transferred to the city, Edgewater can then file for building permits. All this may take between four weeks and two months. Porsche points out that the revised CARA contract with Edgewater now calls for the first five houses to be constructed by Aug. 30, 2015. Eventually, the plans call for 60 houses on the site, between the Lafayette Street trestle and Main Street. Diamond told the CARA board in May that once 19 houses have been built, the state will require crossing protection on access to the development across the Water Avenue rail line before any more can be done. Where the first houses in Edgewater Village are to be built. There is a Sunset date for CARA and has been since the day it was formed. Jim, The CARA Plan says project activities will continue until tax year 2026-2027, unless they exceed the $56,000,000 maximum indebtedness limit before then. In other words, we have another 12-13 years of CARA spending to keep us entertained. I’m certainly glad there’s no appearance of a conflict of interest here! I noticed the same thing, Hasso. What’s the deal here? Something smells. Well at the current rate with no houses in seven years; with a plan for 60. If they get the first one up by the end of the year. Yeah I know, can’t happen. But if they did at that rate it would take 420 years, right? Now that’s job security for somebody, their kid, his, kid, her kid, his kid, her kid, …………. Gotta love managing OPM (other people’s money). Free spending with practically no responsibility. “. . . without CARA the property likely would have remained a wasteland forever.” This is an unwise remark; there is always a price for anything, not necessarily in a monetary form. I have to wonder what barriers have been placed on the use of this property. I venture to guess they exist. Why would absentee owners neglect a valuable property otherwise? I wasn’t going to respond to this, but it’s been nagging at me. I think its disingenuous to talk about physical barriers when likely you know I meant no such thing. I was referring to barriers of a different sort, namely government/city rules and regulations around building, which are prodigious. The CARA Report says that over its life CARA will produce $58.8M of total tax increment receipts. Is there a metric showing progress to date? And what is the expected tax increment receipt for the Edgewater project?